Starting as early as Valentine’s Day this February, up to Labor Day in May, Volkswagen Philippines brings its roster of German-engineered and designed vehicles closer to the Filipino public when it holds tours and exhibits in major malls in Metro Manila. The Volkswagen mall tours, with the theme “German Technology Within Your Reach,” will be held in four strategic locations. The display booths will also provide up-to-date information about all things Volkswagen and an onsite online browsing on Smart TVs for visitors. 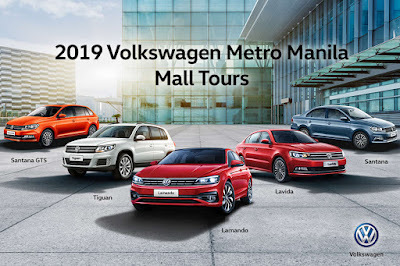 Mallgoers and motoring enthusiasts visiting the displays on those days will get to see up close the roster of vehicles from Volkswagen Philippines: The Santana, Santana GTS, Lavida, Tiguan, and Lamando. Already priced well within reach of hardworking Filipinos, the Volkswagen vehicle lineup on display during these mall tours will be accorded with special financing offers. Premium Volkswagen items as well as fuel cards worth P 5,000 will also be given away to customers who will purchase units on exhibit days. Volkswagen Greenfield District Service Center at 833 Sheridan Street, Barangay Highway Hills, Mandaluyong City.